Anyway, they're typical boys and love cars and trucks; NERF Guns; construction vehicles; toy tools; and anything and everything PJ Masks. 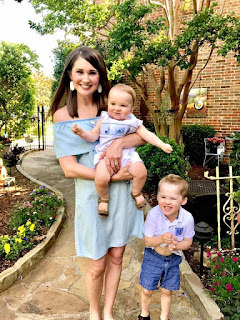 I've posted below some links to their very favorite, can't-live-without-them toys, but first I wanted to show y'all my modern mom's game room closet. This is it right here. Nothing fancy, nothing Pinterest-worthy, and nothing worth writing home about it. (In fact, I took this picture on a random Wednesday afternoon right before I put them down for naps...didn't even attempt to tidy it up whatsoever.) I bought the gray bins (small and large), clear baskets, wire crate and giant Tupperware container from Target. (Where else?!) I had my friend Megan make me the labels on her Cricut. + Matchbox cars: They love Matchbox cars and are always "zooming" them around the house and always have one in the car with them. In fact, I keep a few in my glove box at all times just in case! + Tool sets: Knox is obsessed with the screwdriver ("drew-dry-der," as he says) from this set and Walker loves the accessories from this tool bench my parents gave him for his birthday. + LEGOs: Hands-down a big-time favorite in our house. I buy all kinds of Duplo sets so both boys can play with them and I don't have to worry about the teeny tiny pieces from the older LEGO sets. + Toy kitchen: One of our friends gave us this toy kitchen and they love playing with it daily! Santa found some pretend food from Tuesday Morning, and they'll be getting some more to go along with it this year, too. + PJ Masks toys: They really like these PJ Masks cars with the little figurines, and they're getting this set for Christmas that Santa found when Toys 'R' Us was closing. They also adore these PJ Masks costumes! + Construction vehicles: There are a ton of toy construction vehicles on the market, but the boys really like this excavator, this bulldozer, and this front loader. + Big cars and trucks: Walker really loves this crane truck and Knox carries around this ambulance. Really, they love any toy-sized emergency or construction vehicle. They don't discriminate! + Lawn mower: Walker got this toy lawnmower for Christmas his second year and Knox has now adopted it for himself. He loves pushing this thing outside on the driveway! + Power Wheels Dune Racer: By far the boys' most favorite toy is this Power Wheels Dune Racer. We love that it has two seats so they can both ride together, and they have a ball driving it around the backyard and on the driveway, and often ask to drive it around the neighborhood (so of course I get a good walk in chasing them!). Love seeing the toys they love (boy mom!) and the organizing - I keep Tatum as organized as I can so far. 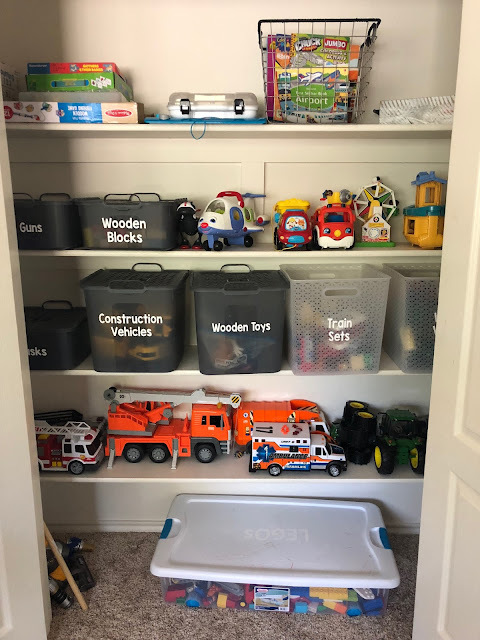 I wish we had a closet in our playroom but as he gets older I'm thinking of switching a closet nearby to it for toys too. I am all about storage solutions that work for both me and for Connor. We have a great system in place and I think you do as well. I love how things are labeled so clearly for the boys and you. E would be in heaven with your boys seriously. Our toys are Target organized as well, but not in a closet I like that, but we do not have one in our playroom. Love the labels though I need to get someone to make me some. I love your realistic approach to organizing toys! Doable and looks tidy but not some crazy detailed system. I love this and love seeing how other mamas organize! It's never easy when there are SO MANY toys - especially Legos and the like! The labels are lovely - I may need to use these tips! Love the storage and organization (it makes my heart sing!) I think we will be getting Ella a play kitchen for Christmas this year! I love this! I think that I'm going to do something similar in Alice's playroom!